Stir the flour into the butter. Let the butter boil off and simmer for a minute. The flour should not take color. Slowly add the milk while stirring. Bring to a simmer and let it cook for a few minutes. Stir well so that all lumps get dissolved and the sauce thickens. Mixing the starch with the butter prevents the flour from lumping in the milk. It also removes the worst taste of flour. 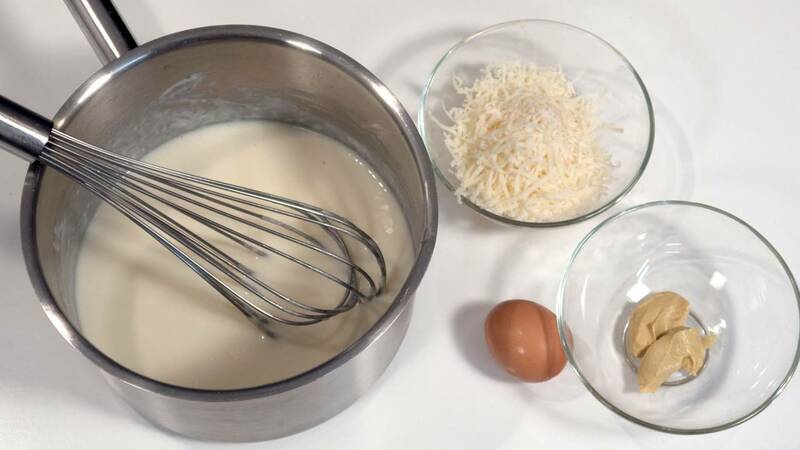 Bechamel can be used as a base for a number of other sauces. That is exactly why it is one of the "Big 5". 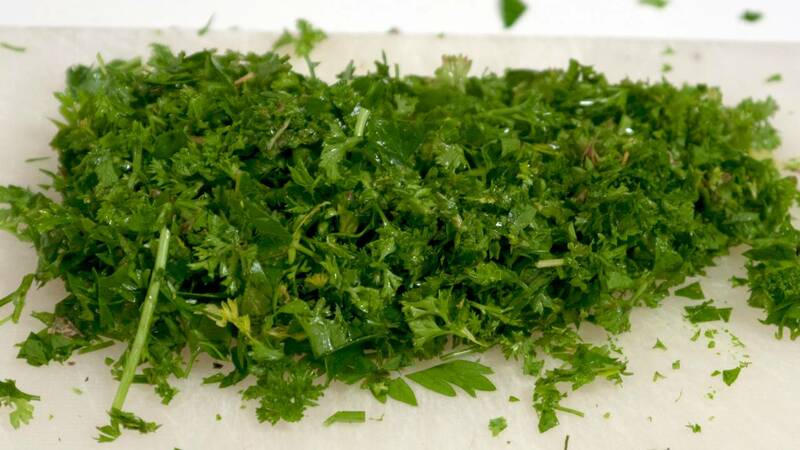 Chop the parsley finely, add it and cook for a few minutes. Let them simmer for 15-20 minutes with the lid on until transparent and soft. 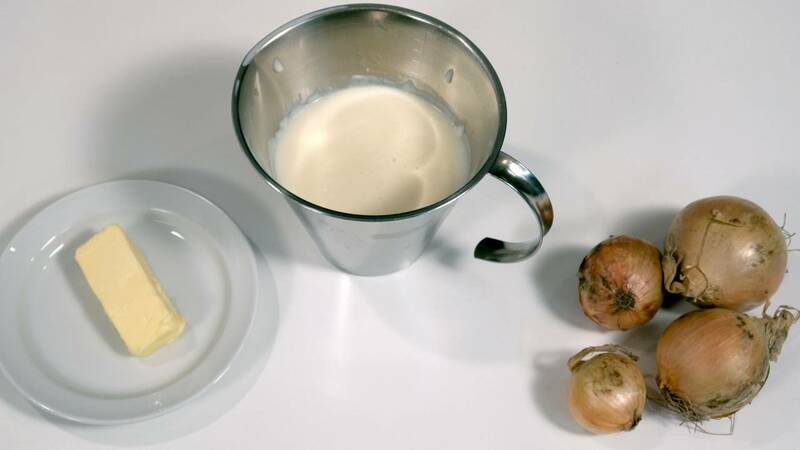 Pour Béchamel sauce over and either blend it with a hand blender, or press it through a sieve. 1 dl (½ cup) grated hard cheese. such as gruyere, pecorino or parmesan. Remove the sauce from the heat and whisk cheese and mustard in. It must not be reheated. Otherwise the egg divides and cheese shreds. if it becomes too thick, you can put in a little warm milk. Pour in the cream and allow to simmer while stirring until it is creamy. Cover the bottom of a pot with as little water as possible. Bring to a boil. Cut the mushrooms into thin slices and put them into the pan. Put in the lemon juice. Let them steam/cook covered, for 4-5 minutes until the mushrooms are tender. Stir occasionally. Add the bechamel sauce and bring it to the boil. If it is too thin let it cook a little while stirring. Fry the onions in the butter until they are translucent. Add curry and tomato. Let it fry for 2-3 minutes. Let it cook in by 1/3. Mix the tomato puree into the bechamel sauce. Take the oysters out of the shell. Save the liquid. Mix 5 tbsp (3/4 dl (1/3 cup)) oyster juice and egg yolks together. 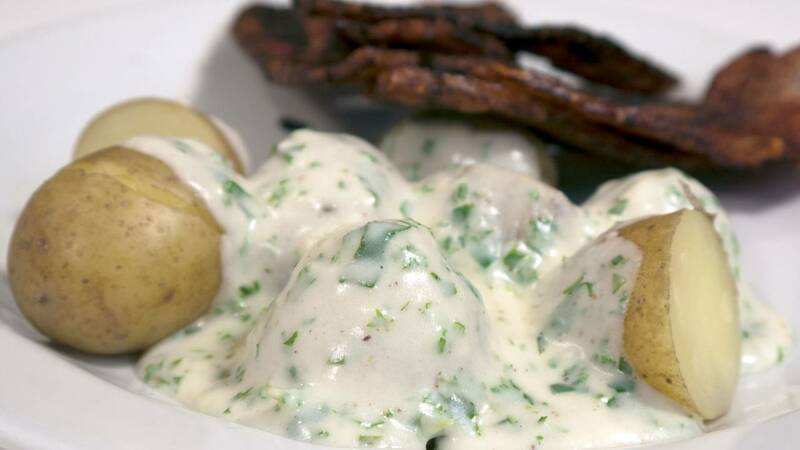 Pour the egg and oyster juice into the sauce. Warm it up until it starts to thicken. It should not boil. Take it off the heat and pour the oysters in.